Lately I haven't blogged a lot. Why? Well, I've been learning. And that takes time. Apparently. In preparation of my new job, I have been offered an intensive five week training; Culture and Development, Capacity Building (see the trainer's account here) and Teaching Skills have already been finalized. Now it's just a safety training, facilitation and communication on my to-do list for September and October. Well, I must admit: it hasn't been easy, all that learning. It's been a while since I'd been in school and my last course was in November last year (Planning, Monitoring and Evaluation in Nepal with CRSC, which was great! ), so it took a while to get back in shape. It made me think about how it is that I learn (a question I have also asked myself lately in the context of speaking French and dancing salsa). What is a good learning environment for me? Which is the right challenge? And for my work, the question is how people in an organization learn and how they can transfer their knowledge. One thing I encountered while learning was resistance. From within, deep deep within. Not so much a resistance to learning in itself, but resistance to failing. It was pure fear, fear of failure. Because failing is not fun. I want things to be right from the get go. And that never (or hardly ever) happens. You should burn your fingers first a few times. 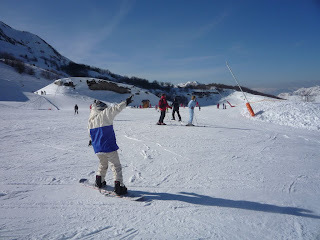 That I also found when I tried out snowboarding for the first time this February. How frustrating to not even be able to get up by myself! But after fifteen minutes of ranting and telling myself: "You can do this! 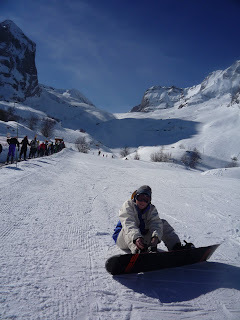 ", I was standing on the board and sliding down the slope. For just a few meters, but the beginning was there. And THAT is how we learn. To dare and fail. And to dare again. As Tim Ferris says: "Smash fear, learn anything".